This time on my Fictional Spectrum series, I am spotlighting the protagonist in Serial Experiments Lain. 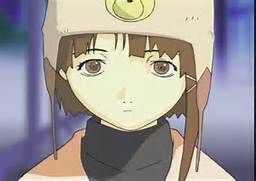 What is it about Lain that makes me feel she is on the spectrum? First of all, she rarely looks at anyone who is talking to her. She always has this faraway, distant look. As a child, I did the same thing. My mom, not knowing how normal this is for someone like me, helped me to outgrow this behavior, but I still have my moments. Lain has few friends. Sure there are three girls who talk to her, but only one of them, Alice, seems the friendliest. The others don’t even seem like they’d socialize with Lain if she didn’t. Lain catches on to her new computer quickly, with very little help from others. It’s an obsession for her. I can identify with this, as I have several obsessions, ranging from anime to sci-fi. In Lain’s case, her obsession causes her to be more detached. Her entire life is literally online and it begins to blur her perception of reality. To me, Lain shows us why we should not leave people like her in their own world and not help them. Because she was not encouraged to come out of her shell, she retained her shell and became more detached from society. This anime is a great story and I think it’s neat that it has a seemingly autistic protagonist. I highly recommend this series to my readers. Note: I am now continuing my Saint of the Month series, however it will not always be monthly. For this reason, I am now calling it My Favorite Saints instead. The Acts of the Apostles introduces an apostle who was once an enemy of the Christians. We know him today as St. Paul. St. Paul was originally named Saul of Tarsus. Under this name, he was present when the church’s first official martyr, St. Stephen, was stoned to death. This incident inspired him to persecute anyone who followed the Way (which is what Christianity was called at the time. ) Yet, Jesus sought after him and confronted him (Acts 9:1-9), blinding him in the process. He eventually converted after being assisted by a member of the apostles’ community, and earned a new name, Paul. When a biblical figure changes status, there is often a change in name as well. Abram became Abraham after he decided to follow God, and his wife Sara became Sarah as well. In the new testament, Simon became St. Peter when Jesus gave him the new position as the leader of the apostles prior to his crucifixion. This also made him the first pope. I think what I really like about St. Paul is his eloquent approach to evangelism. What follows are some of my favorite quotes from his epistles. “If I speak in human and angelic tongues but do not have love, I am a resounding gong or a clashing cymbal. And if I have the gift of prophesy and comprehend all mysteries and all knowledge; if I have all faith so as to move mountains but do not have love, I am nothing. If I give away everything I own, and if I hand my body over so that I may boast but do not have love, I gain nothing. Here’s another interview, this time from a teacher, Becky Suman. 1. When did you become a Christian? I became a Christian the summer before my fourth grade year. My mom shared the plan of salvation with myself and my sister on the way to my sister’s appointment at a children’s hospital. Both of us (my sister and I) asked Jesus into our hearts that day. I am a high school science teacher (and this year I’m also teaching 8th grade science) at a Christian school. In addition, I work part-time all year at Macy’s. There, I’m an AST associate (Administrative Support Team) and work in the executive office at our store. 3. What is your favorite Bible passage? I’ve always said that David was the very first Goth (or at least Emo). I can absolutely get lost in the Psalms. God has used David’s words many times to reach out to me and yank me out of very dark places. Psalm 63 for the win! 4. What proof would you give for God’s existence? I can’t help but to look at Creation (or Nature as many would say) and see God. We were just talking in Biology class the other day about the cell’s respiration processes. It is so amazingly intricate. One little molecule out-of-sequence and your cells don’t receive the energy that they need in order to survive. I look at that and see a little glimpse into my Creator. He has a plan that is intricate and beyond my understanding, but I have Hope that He knows all and is in control. I grew up in a Christian family and in the church. I was able to attend Christian school from 8th grade through 12 grade and am forever grateful for the sacrifices that my parents made so that I could attend there (I had a hard time in public school with bullying due to my introvert, nerdy nature). My mom lauded education, so I developed a life-long love of learning from her. My dad is a hard worker and I think a little of that rubbed off on me as well. I remember a childhood of playing make-believe with my sister, days out in the yard/garden, and time spent at church both on Sundays and at kids choir and the girls program there. It was a good childhood. We didn’t have much money, but I don’t think it mattered. I didn’t care that we didn’t go on vacations far way. We stayed near home and did things together. Those are the memories that are lasting. My all-time favorite band is the B-52s. They are a quirky band with extremely catchy lyrics and a unique sound. I just like how weird the band is. Wild Planet: If you were to ask me what the best album ever was for this band, it would be this one. Here, they found their niche (very early) and the production work is solid. My favorite track would definitely be “Private Idaho”. The next two releases, Party Mix and Mesopotamia were EP’s. Party Mix is a remix album that I don’t particularly recommend. Mesopotamia has production work from David Byrne of Talking Heads fame. It’s a pretty decent release, and Reprise Records has actually combined both of these into a single CD. Whammy was not the best CD. Sure, it contains the great songs “Whammy Kiss” and “Song For a Future Generation”, but the rest of the tunes just aren’t as good as what was released previously. After a few years, the B-52s got a new company and decided to start releasing CD’s again. First was their most popular CD, Cosmic Thing, featuring their biggest hit, “Love Shack”. Good Stuff is the only CD not to feature Cindy Wilson, and man does it show. It’s the album I like the least. There are some good songs, like “Is That You Mo-Dean”, “Bad Influence”, and “Hot Pants Explosion”, but without Cindy, the band feels incomplete. Their most recent CD, Funplex has Cindy back in the band and it’s very good. I can’t think of a single song on this release that I don’t like. And there you have it. The B-52’s. My all-time favorite band.